Hi all... well my new stainless steel cutter arrived from the US! Yay! With two new blades, a smooth one for clean cuts and a crinkle blade which creates a lovely wave on the surface of the soap. These were made about 10 days ago and have been sitting in their cosy little homes waiting for the cutter to arrive. Hubby and I decided to cut them tonight and take pics using the new photobox he made me. This is called Coffee Culture© and its a combination of clear glycerine and goatsmilk soap, with added cocoa butter and an additional skin moisturising agent... it's fragrance is a sweet coffee, vanilla and roasted hazelnuts, good enough to wake you up in the morning. The next one is called Orange Blush©, it's fragranced with bergamot and orange blossom with delicate cottony florals with a base of precious powdery musks, a really beautiful scent. 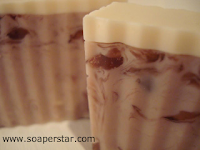 It also has added apricot kernel oil to make a very luxurious soap. It's very suitable for both men and women. This soap also has added mica which gives it a lovely glisten too. 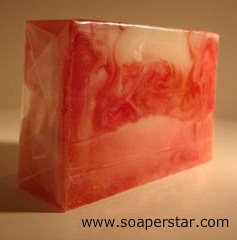 Hope you enjoy both of these new soaps - our website, http://www.soaperstar.com/, will be open very shortly - keep an eye out for updates!!! New Soaperstar Store is opening Tomorrow!!! Sorry no posts - been a busy bee!